New forest garden beds have a wide variety of closely spaced plants. It’s time for another tropical forest garden update after a little over four years since the garden was started. A year ago it looked great as you can see in this video: Our Forest Garden is Finished! Things have changed dramatically this last year for the better. I had heard that if you keep adding organic matter to the beds, thick mulch on top, roots in the ground and keep the soil moist, eventually you’ll hit a tipping point where the earth worms and countless soil microorganisms just ‘pop’ or go viral with exponential growth. That’s what’s happened in our garden this past year. Now we see large earthworms when we dig even small holes. It’s hard to dig without chopping them in pieces. Maybe I need to switch to a garden fork to save the worms. This improved soil fertility has created a frenzy of jungle like plant growth. One taro or pineapple plant, for instance, turns into a dozen new plants and they keep multiplying. Single banana plants from four years ago have multiplied into dense 8’x8’patches of 1-2 dozen plants each. This is not healthy for banana plants however and so we have to routinely thin them out to prevent pest problems. We now pay a worker to do a major pruning and thinning every few months. This opens up the canopy so fruit trees get adequate sunlight. When he’s done it looks sort of like a hurricane has gone through. 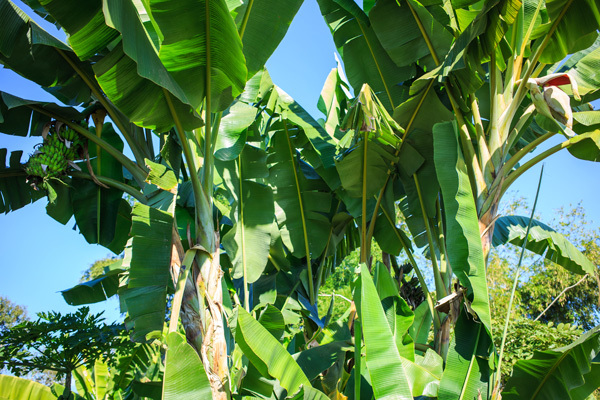 The beds and pathways are almost completely covered with branches, banana leaves and banana trunks scattered everywhere. My job is to clear the pathways and put all this biomass around the fruit trees and along the edges of beds to reduce erosion. Even though the brush piles may be 1’-2’ feet deep, almost everything is decomposed in 2-3 months in our climate and soon the whole process has to be repeated. We’re extremely happy with the new banana plants we planted last year. This has greatly increased the number and size of banana racks. Some racks are too large for an average person to lift. Our original banana plants were gifted to us by friends or purchased cheaply from the local market. I’ve learned since then there’s a huge difference between ordinary plants and the ones from a professional banana farm, like where these new plants came from. The new ones are very fast growing, produce much more consistently, produce racks at chest height for ease of harvesting, and due to their lower height and stocky trunks they do not blow over in the wind. My plan is to phase out the old mediocre plants and gradually replace them with the best baby banana ‘pups’ from these new plants. This one simple step should double banana production next year, not including the bananas on the new land, which I’ll cover in a later report when they get bigger and more photogenic. 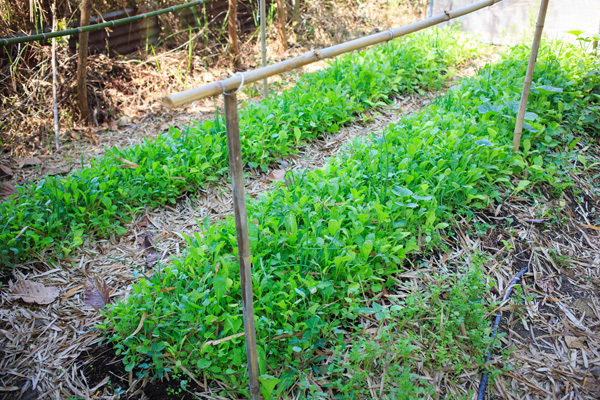 Living mulch: The heavy rains here in the rainy season and the extreme heat in the summer require keeping the garden beds covered year-round for plant health and to prevent erosion. We had been applying truckloads of straw. 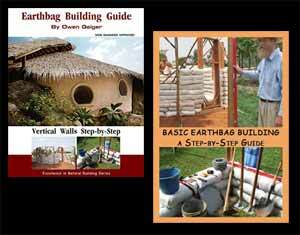 It works great but it takes a lot of straw and needs to be done twice a year – once before the rainy season and once before summer. I soon realized this would really add up year after year (in time, labor and cost). Wood chips are more durable, but unfortunately not available here. So now we’re going to grow orange and purple sweet potatoes as a living mulch in almost all of the beds (except one bed that’s too densely overgrown for potatoes to grow). Sweet potatoes grow like weeds with no assistance once established. The primary purpose of the potato living mulch is to prevent erosion as I said. They create very dense networks of roots and vines that hold the soil. Sweet potato leaves shade the ground from intense sunlight and help prevent overheating of soil. This saves water in the summer and makes it very hard for weeds to grow. And, of course, they create a staple, very nutritious root crop. Leaves are also edible. Other advantages of potatoes as a living mulch: they’re nearly indestructible (you can walk on the plants); they will grow in full sun or partial shade; you can scatter manure, compost, rice hulls, chopped coconut husks, etc. on top; the potato vines stimulate soil organisms that benefit surrounding trees and plants; having more plants with more leaves means you’re capturing and storing more carbon in the soil; you can easily add other plants such as extra pineapples, flowers, etc. anywhere you want at any time, no problem. The biggest advantage of living mulch is way less mulch is needed each year. New garden beds: I made about 50 garden beds between fruit trees and banana plants. The photo above is not the best example because it’s a separate bed with no fruit trees, but the basic planting concept is the same. This idea was inspired by the video Food Growing Like Weeds. The main idea is to add diversity, and help build and protect the soil. The new beds contain an intensely planted polyculure of easy to grow herbs and veggies such as lettuce, daikon radish, dill, spinach, kale, okra, roselle, and pumpkin. I added some volunteer papayas from other parts of the garden for variety and because most of our older ones died off or fell over in the wind. I planted lots of seeds and let them struggle for survival of the fittest. Taller plants like roselle and okra help shade the more delicate lettuces and herbs. Results have been mixed. It’s been tricky because each bed has slightly different conditions. Certain plants are real sensitive to drying out and wilting in the heat. One bed is perfect. The plants in that bed are now fully self sustaining. The goal is to keep enhancing the other beds until they’re all thriving with minimal care. A lot of plants won’t make it but that’s okay. I just want to keep it simple and natural like little patches of edible meadow between trees. this is great news and very encouraging for the world to hear. keep up your great endeavors. Thanks. We’re really happy with it. This may be the most enjoyable project of my life. How can you beat working in a garden of Eden to grow our own food and restore the earth? I think more people will pay attention when the new forest garden gets bigger. It’s 100 times more efficient and so it’s suitable for massive replication. This agroforestry method can restore damaged portions of the earth and replace much of modern agriculture. I’m willing to consult with anyone who wants to scale up this idea for profit like Jean-Martin Fortier has done with market gardening. We had our first bumper crop of mulberries. Our first year we planted over 100 short pieces of mulberry branches around the perimeter of the garden. Most died as reported earlier, but the ones that got lots of sun are thriving. We chop them back to keep them under control and make it easier to reach the fruit.